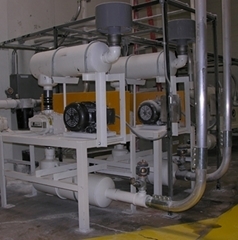 Thomas Conveyor and Equipment Company, Inc. associates have been designing, procuring and installing Pressure Pneumatic Conveying Dry Bulk Powder Handling Systems for decades. We design and engineer New systems and specialize in retrofits to existing, underperforming or worn out equipment. Our team has solved hundreds of existing problems that others won’t touch. We will provide you with a solution only with your 100% input and approval. We solve tough problems. Thomas Conveyor and Equipment Company, Inc. associates have been designing, procuring and installing pressure pneumatic conveying dry bulk powder handling systems for decades. We design and engineer new systems and specialize in retrofits to existing, under performing or worn out equipment. Our team has solved hundreds of existing problems that others won’t touch. We will provide you with a solution only with your 100% input and approval. We solve tough problems.